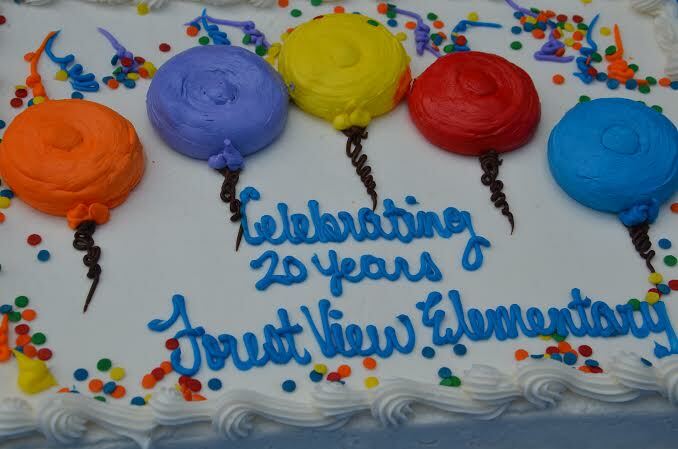 On Saturday, May 17th, more than three hundred people gathered on a beautiful spring afternoon to celebrate Forest View Elementary’s 20th year. Alumni joined current chorus members to sing the national anthem and “Home” (made famous by American Idol season 11 winner Phillip Phillips) and also entertained us with cello and violin performances. All three Forest View principals (Toni Hill, Lisa Napp, and Neil Clay) joined in the fun and shared their thoughts about Forest View’s strong community. Alumni reconnected with former teachers and toured the school, flipped through old yearbooks, and shared their own stories about our school. Families enjoyed snow cones from Kona Ice, a community art project, science exhibits, making rockets, and contributing to the time capsule for the next 20 years! The afternoon ended with the crowd singing “Happy Birthday” to Forest View and lots and lots of birthday cake. Many thanks to 20th anniversary committee chair Sneha Shah Coltrane and all the committee members for their hard work, dedication, vision, and enthusiasm, which made this celebration such an amazing event.